A study of globe artichoke determined impacts of pretransplant management of nitrogen and fertigation system on transplant quality and subsequent growth. 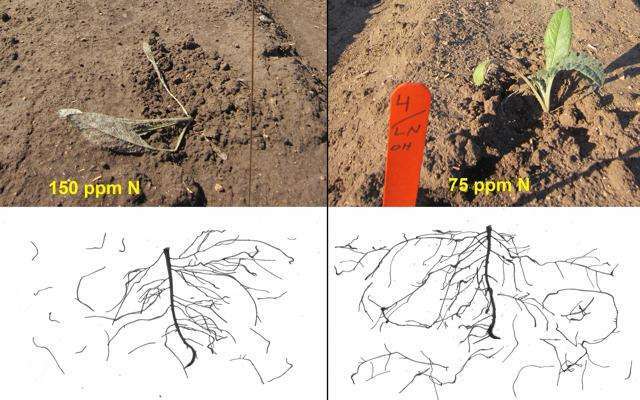 Photos show artichoke transplant roots after 8 week of fertigation using 150 and 75 ppm N solution (top), and evaluation of transplant stem plasticity and root quality determined by using a digital force attached to a vertical motorized force tester (bottom). Credit: Daniel Leskovar. According to the authors of a new study, transplant shock is very common in globe artichoke grown in semiarid regions of the United States; high air temperatures and drought stress after transplanting can delay root and shoot growth and significantly reduce marketable yield. To counteract the effects of heat and insufficient irrigation on artichoke crops, researchers are seeking to determine the best nursery practices for plant nutrition and irrigation.